On September 20th, Puerto Rico was devastated by Hurricane Maria a mere two weeks after a brush with another hurricane, Irma. Recovery efforts in the ravaged U.S. territory have been lackluster, and many are still without power, water, or communication. Surprisingly, some of the most innovative and enthusiastic support has come from non-traditional sources — American tech companies. At the time of writing, roughly a month after the storms, aid workers and citizens alike are still putting the pieces back together. As of October 20th, CNN reports that more than 80 percent of the island’s residents are without power, and 35 percent are without reliable, clean drinking water. Unfortunately, while the official death toll has now climbed to 51, some estimates put the total loss of life closer to 450. The longer it takes to restore livable conditions there the higher the number will rise, and they are desperately looking to their fellow Americans for help. While response at the federal level has been sluggish, other sources are working quickly to get Puerto Rico back online. Companies from the U.S. are seizing the opportunity to test out new, experimental technology that can restore the communication and electricity that they desperately need. Foremost among them are Google and Tesla, two corporations already widely known for their successful innovation. Both in the sky and on the ground, they are not only lending a helping hand but are laying the groundwork for how we will help people recover from disasters like Irma and Maria for years to come. Like the winged hussars at the Battle of Vienna, Google has arrived in Puerto Rico in their darkest hour. However, instead of heavy cavalry coming down the mountainside, enormous balloons are floating in from offshore. This is Project Loon, an initiative by Google’s parent company, Alphabet. Their goal is to establish a network of floating signal relays that can extend Internet access and cellular signal to places that find themselves without it. The balloons operate by taking in solar energy during the day and storing the excess in a battery for use overnight. The stored energy then powers a built-in navigation system that allows the balloons to predict wind direction at different layers of the stratosphere. They then ascend and descend according to where they need to go. While much of the technology Project Loon utilizes is experimental, they’re getting much better at doing what they do. Puerto Rico is only the second disaster-afflicted area they have been deployed in — a flood-stricken Peru being the first earlier this year. In a recent blog post by Alphabet, this is the “first time we have used our new machine learning powered algorithms to keep balloons clustered over Puerto Rico, so we’re still learning how best to do this.” The balloons can now stay afloat for 190 days, and they’re using what they have learned to keep them looming for as long as possible over the areas that need them. They’re now employing small, portable, crane-like devices to get the Loons into the air as quickly as possible. According to Project Loon, these systems can get a balloon into the air in under 30 minutes. This is much easier than attempting to fly the balloons across the considerable distance from the mainland, which was one of the major logistical hurdles they faced before deployment. Now, by working with Puerto Rican aviation authorities and transporting these launchers into the territory, the balloons can take flight in the immediate area, vastly simplifying the task at hand. On October 20th, they officially flipped the switch and began broadcasting the sweet signal across Puerto Rico. As the balloons are tested in this real-world scenario, only time will tell if they become an expected sight in the sky over disaster zones. Restoring Internet and cellular signal is just one part of the job, however. There’s much work to be done on the ground, as well. Having a Wi-Fi connection is of no use if there’s no power for the people receiving it. Enter Tesla, an equally revolutionary company that is now putting its considerable resources toward restoring electricity to a demolished grid that is still leaving millions in the dark. This presents an issue because obviously someone needs to turn on the lights — and it appears that that “someone” is Tesla. Fortunately for us, when the government does not provide adequate services, the free market — namely private businesses — tend to compensate. That is precisely what’s happening in Puerto Rico, and not only has Elon Musk’s tech firm been working hard toward recovery, but they’re doing it pro bono. They have been shipping hundreds of their Powerwall solar batteries and solar panels for use across the island. Just recently, Tesla made news by restoring power to the San Juan Children’s Hospital, a facility that cares for over 3,000 patients. 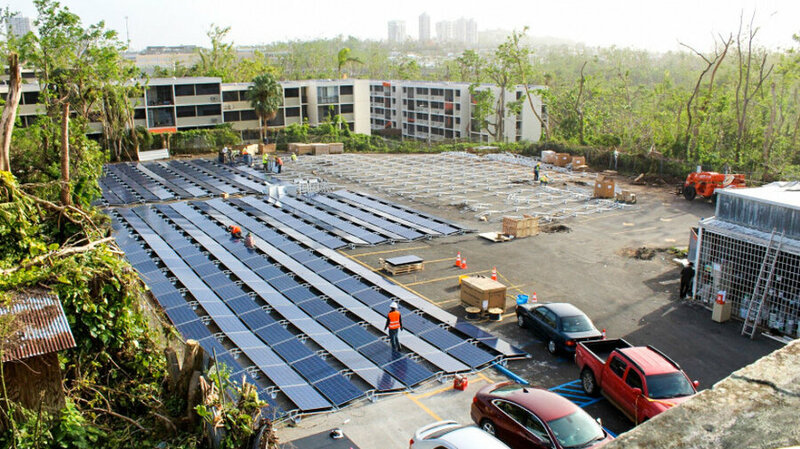 The hospital has been outfitted with enough solar panels and batteries to be self-sustaining, and Musk has said this is just the “first of many” similar projects he has planned for Puerto Rico. They go on to describe a Puerto Rico with a utility system deeply in debt, barely able to perform existing maintenance, much less recover from a disaster of this magnitude. As is usually the case, this problem is not just going to go away with time. It will have to be fixed by those outside Puerto Rico that have the power and resources to do so. Also, while Tesla and Google are making little to no money from this, they’re setting a precedent for something that goes far beyond short-term profit. They’re playing the long game, attempting to create a world where they’re an integral part of relief efforts like this. But if they’re doing much of this work for little to no charge, what’s in it for them? The privately-driven efforts in Puerto Rico and around the world are redefining expectations on how we assist areas in need. Tesla has also been attempting to install the “world’s largest battery system” in South Australia, pledging to complete the project in 100 days or forgo payment entirely. According to Tesla, the battery linked to the enormous Hornsdale wind farm will be able to provide power to 30,000 homes. It will charge using excess energy, and then siphon off the reserves during peak hours to reduce strain on Australia’s power grid. Throwing around promises of free work might seem counterintuitive, but to understand the motives behind these initiatives, one has to look at the benefits beyond strict financial gain. First, helping those in need directly sells the point that these companies make a positive difference. These grand gestures generate a tremendous amount of buzz, and it is working; Elon Musk and Tesla are household names, continuing to make front page news. The eyes of the world are on them as them as they undertake revolutionary projects one after another, namely in public interest. As I briefly mentioned earlier, they’re laying the foundations of a world where Tesla is not just fascinating; they’re irreplaceable. They want to ensure that they rebuild those ravaged power grids and that large-scale solar installations bear the Tesla name. If they succeed, they could end up taking the place of major utility companies in various countries or at least provide a considerable amount of the power infrastructure. As the world continues to shift to renewable energy, Elon Musk is waiting with open arms. The same goes for Google — if Project Loon can become the standard for restoring Internet and cellular signal to blacked-out nations, it will open up a wealth of new opportunities for them. There may come a day when they can outsource their technology to other companies worldwide and send their balloons to friendly skies wherever they’re needed. It presents an opportunity for them to make a significant profit while simultaneously providing valuable resources for other nations to react quickly to natural disasters. If the Puerto Rico disaster response has shown us anything, it is that in the face of natural tragedy, be they hurricanes or bureaucratic ineptitude, people find a way to help one another. As American businesses invest in assisting those in need, they’re not only helping the afflicted. They’re fostering a climate of innovation that rewards those that contribute to the development of a safer world. Just as the citizens of Puerto Rico will weather these physical storms, the businesses that make an effort to help them will weather economic ones.